As any parent of dish-making, laundry-creating teenagers will tell you, it’s never too early to start your child doing household chores. The sooner you teach kids to take on some housecleaning, the better off you (and everyone) will be. Sure, there’s a temptation to say, “Oh, they’ll mess it up and then I’ll have to do it myself anyway.” However, by finding age-appropriate chores for your kids to do, they can actually learn to keep your house fabulously clean. Here are some great tips. Have fun “burying” a toy in all the laundry they can collect and put in a laundry basket. (Just make sure you take out the toy before you do the wash!) You can do something similar with trash in the trash can. If you’re worried about your child breaking Grandma’s china, make them responsible for setting the “kids’ table” with the plastic plates and sippy cups. It’s a great time to teach about table manners, too. To make sweeping with a small broom or small handheld sweeper fun, you can put on the soundtrack to “Cinderella” and sing away. 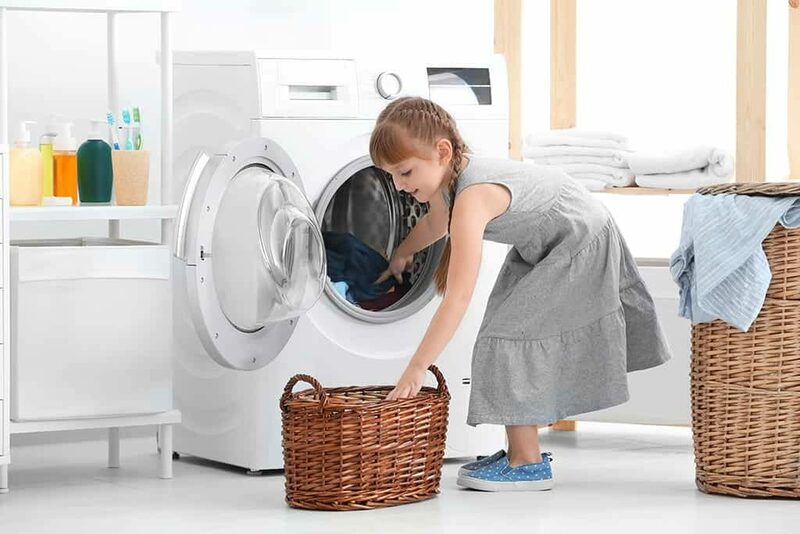 Kids at this age are great at loading and unloading appliances like the dishwasher (except for the knife drawer) and the washer and dryer. Kids can also take a damp rag and help to wipe down bathroom sinks, toilet seats, and countertops. Trash patrol is another helpful chore kids this age can do. Hand kids a large garbage bag to take all over the house and fill with bedroom, bathroom, and office trash. Have kids recycle glassware and aluminum cans. For future culinary experts, kitchen skills, including stove and oven safety, are great to learn. Prepping veggies, microwaving food, and learning basic cooking techniques are lessons they’ll be glad to learn. Taking responsibility for family pets is crucial too. Taking the dog on a walk, feeding and brushing your pet, or cleaning up yard messes are genuinely helpful chores. They’re so grown up! At this age, kids are ready to babysit younger siblings, clean out the refrigerator, organize the garage, or cook full meals. Bottom line, kids may need some initial guidance and supervision at first, but be patient. They’ll get it. Remember, you’re doing more than delegating household chores: you’re teaching your kids how to adult.